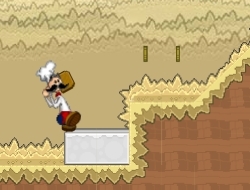 Papa Louie was teleported when he opened the pizza box and now he is in a very strange world where food is rioting against the chefs. He will need all your help to get back to his Pizzeria safe and sound. Walk around the world and start collecting the coins, but whenever you see an union or any other pizza ingredient, start swinging your hammer to knock them out. Also you will have some pepper bombs you can use to do this from a distance, but they are limited, so collect them also whenever you can. Jump over the obstacles and use your hat to glide if there is a bigger gap you cant normally jump over. Have some fun with it and bring order into this mad pizza world. Use the arrow keys to move, Space or C to jump, Z to swing your hammer and X to throw pepper bombs. Press Speace in mid air to glide using your hat. Papa Louie When Pizzas Attack 10.00 between 0 and 10 based on 1 votes.